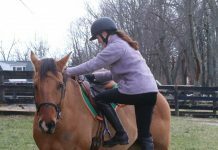 Doing well at horse shows is all a matter of preparation, and if you plan to jump at a show, you must be able to jump your horse at your own barn. You should feel safe on your horse and feel confident that he can easily pop over the fences you put in front of him. Show organizers post showjumping courses outside the ring. They are usually stapled to the fence plank or a bulletin board near the gate. Give yourself a few minutes to look at the course diagram and to look out at the arena so you know which fence is which. You’re usually allowed to walk the course without your horse before you ride. There will be an announcement stating, ” You may walk the course now” and you’ll have about 10 minutes to go in the ring and check out the course close up. You can’t take your horse in the ring, so ask a pal or parent to hold your horse. If you are at a show with your trainer, he or she will probably walk the course with you. When you enter the ring on foot, decide how you are going to approach the first fence. Figure out which lead you need to be on, and decide where you’re going to pick it up. If you plan to do a courtesy circle decide where you’re going to do it. The first fence of a course is usually straightforward and simple. It might be a small upright fence or cross-pole, depending on what kind of course you’re jumping. It probably won’t be wide or covered in spooky decorations. Take a good look at the fence and make a mental note to aim for the middle of it when you’re jumping.Then walk around the fence and look for the next fence. Head on your way around the course. Pretend you are on your horse. Are there any fences that might scare your horse? Alex notices that this simple-looking pole fence has a water tray under it. It’s blue and it has water in it. Alex’s pony might look at it, so Alex knows to ride strongly into this fence. If you think that your horse might spook at a fence, plan to really squeeze your legs around him or give him a kick as you approach the fence. And plan to look up and over the fence—not down at the water tray. Always look towards the next fence. Alex is checking out this solid wall, but then he’ll look to see where the next fence is so he knows where to steer his pony once they land. Sometimes there may be a sharp turn to the next fence—especially in jumper classes—so you might have to turn your pony’s head while you’re jumping. That’s a lot to think about while you’re in the air! A combination is a series of two or three fences that are placed one after the other with aset distance between them, usually allowing for one, two or three canter strides. The first fence is usually a simple upright and the second one is usually a spread. The course designer has decided how many strides your pony should take between the fence, and you’ll ride the combination better if you stick to this number of strides. Alex knows that his pony should take three strides between these two fences so that’s what he’ll be aiming for when he’s in the saddle. Some people like to walk the course twice. That’s OK. Walk it as many times as it takes for you to feel confident. Now that you know the course by heart, it’s time to hop into the saddle, warm up and then wait for your number to be called. Then it’s time to think positively, do a courtesy circle, pick up a good pace and head for the first fence. Since you’re prepared, you shouldn’t get lost in the course. But if you do go blank after a fence, slow your pony down for a stride or two, take a deep breath and look around the next fence. You’ll soon be back on track.